Do you want to feel better, get up easily in the morning, have much better energy levels during the day that keep you in a good mood? Then I can offer a very good meditation practice including specific breathing patterns, special posture and movements, exact positioning of the hand and fingers, particular mantras and a unique mental focus. With that I am offering a complete course about the physical symptoms, emotional aspects and characteristics of the main Chakras. Chakras are concentrated centres of energy. They control the vital organs and provide the body with energy. If these power centres are not functioning well, the organs become sick. Balanced Chakras are the foundation of physical, emotional and mental health. Chakras that are out of balance are the reason why your energy level might not be as good as it could be, or why you might not be as creative as you could be, or why you might not feel as appreciated and loved by others as you should feel. The founder of this meditation technique is Dharma Singh Khalsa, M.D., a doctor and yogi; he worked with a lot of people who had serious diseases. The combination of yoga and meditation helped them not only to heal their body but also their mind and their soul. I invite you to the Chakra Meditation Course. TIME 7.30 - 8.30 p.m.
"Thanks for such an excellent start to exploring meditation" S. M.
After each meditation class you will feel the difference. Your symptoms will vanish. Your mood will improve. 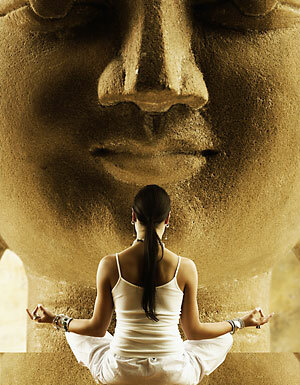 Meditation is the tool to inner guidance, joy and freedom. I would love to welcome you to this course.